The Randy Report: Olivia Newton-John, Amy Sky & Beth Nielsen Chapman Chat On "Liv On"
Olivia Newton-John, Amy Sky & Beth Nielsen Chapman Chat On "Liv On"
Olivia Newton-John, Beth Nielsen Chapman and Amy Sky chat with Jenny McCarthy about their new album, LIV ON. The unique project brings the three acclaimed singer/songwriters together to explore and move through grief - a subject rarely addressed by popular music. I've heard the album and it's quite fabulous. 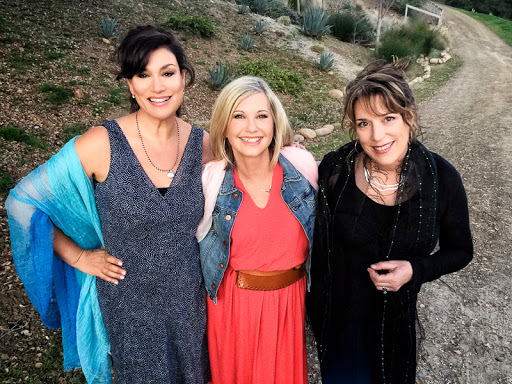 Trading lead vocals, harmonizing beautifully, the trio delivers a collection of songs that I think many people facing loss will be able to connect to on a deeply emotional level. This very special collection of songs will help lift the hearts of others going through their own hardship, whatever the cause. From the uplifting “Stone In My Pocket” to the poignant, “My Heart Goes Out To You,” the songs on the “LIV ON” CD take the listener on a journey of remembrance, toward one of inspiration and hope. LIV ON also brings listeners epic songs such as Beth Nielsen Chapman’s “Sand and Water” which was created following the passing of her husband. As well, the three mega-stars have created several brand new songs, including the title track, “Live On,” which born of their own exploration into the pain of loss, the growth that follows and eventually, the journey toward renewed joy.